July 31, 2017. Last year, a Madison summer program worked with teens to make frozen pizzas from scratch to help them build business and cooking skills. Before the pizzas, Malia Green hadn’t had much experience cooking. She’d only really ever made boxed brownies and mac n’ cheese, she said. 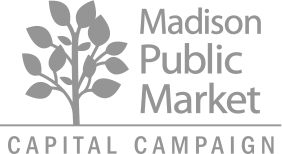 But months spent perfecting the pizza dough gave her new skills, and now she’s excited about the program’s next step: A job program that includes expanding to a full-blown business operating out of Madison’s future Public Market. “(That) would make me feel proud, because we started from what little we had and we’re starting to make it bigger,” she said. The pizza project has been a cooperative effort between University of Wisconsin Extension, UW-Madison’s PEOPLE program and Mentoring Positives, a nonprofit in the Darbo-Worthington neighborhood that serves at-risk youth. For years, Mentoring Positives has produced Off the Block salsa, now sold in Metcalfe’s Markets. It started as a fundraising effort and, as the name suggests, a way to keep kids off the streets. It was originally made with tomatoes and peppers grown by neighborhood teens in a community garden, although it has since outsourced production. Last summer, PEOPLE interns and three middle-school students at Mentoring Positives tackled a similar project by creating a recipe for pizza and writing a business plan to market it. Will Green, Malia’s father and founder of Mentoring Positives, saw the pizza’s potential and Donale Richards, an intern with UW-Extension, stayed on through the school year to continue helping the middle school students perfect the recipe. This summer, the project is funded by a SEED grant from the city of Madison, which will allow the same three students from last summer to create a “mini mass production” of 200 pizzas to help figure out cost models, Will Green said. The pizzas will debut at the Peace Walk in the Darbo-Worthington neighborhood on Aug. 24, but the bigger vision is to bring the pizza and salsa to the Public Market and grocery stores like Metcalfe’s, Will Green said.